On 15th April at 3.00 p.m. we are thrilled to be hosting this concert, as part of our Sunday afternoon concert programme. Katherine has performed several times at Christ Church and this time it will again be something new for our audience. I hope you are as excited about the programme as we are and feel you want to join us for an afternoon of simply beautiful music by two highly accomplished and respected musicians. 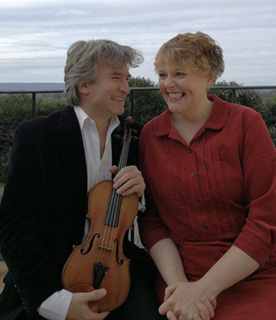 I was honoured when Katherine contacted me and Enigma Duo are in such demand that it has been booked for a long time, testament to their popularity. And so, what treats are in store? 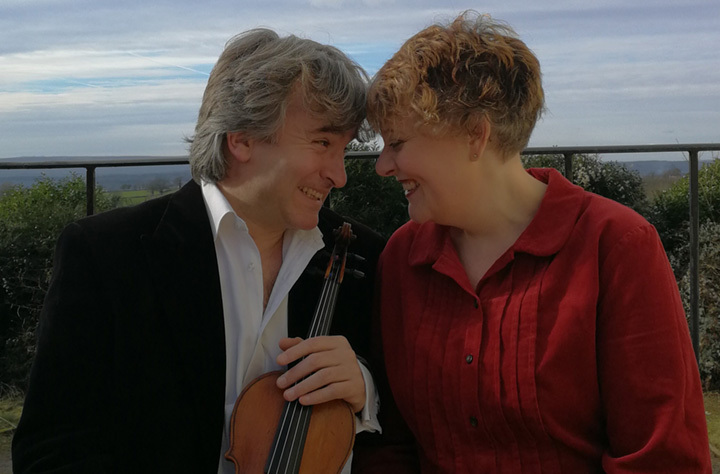 Rêves d’Amour will include beautiful music by Elgar, Dvorak and Pärt, and melodies from stage and screen including Ladies in Lavender and Scent of a Woman. As ever we will have an interval with refreshments to add to your enjoyment. Laurence Kempton studied violin and chamber music at the Royal Academy of Music, where his teachers included Maurice Hasson and members of the Amadeus String Quartet. He left to take up the position of Principal 2nd Violin with the English String Orchestra, where he worked closely with Yehudi Menuhin. He has subsequently played with many of the country’s finest orchestras and world renowned conductors, performing throughout Europe, Africa & Asia. As a soloist he has recorded for both CD and television, and concerto performances have included the major works of Bach, Vivaldi, Mozart, Mendelssohn, Bruch and Beethoven. As a chamber musician he has performed extensively both in this country and abroad, with a variety of performances ranging from broadcasting live on Radio 3 to recitals at festivals throughout Europe, and the intimate setting of hospice wards as far afield as Hong Kong. Katherine Thomas is a harpist who has performed with artists varying from Bryn Terfel and Rolando Villazon to Katherine Jenkins and the Manic Street Preachers. She has toured extensively as a soloist and with orchestras such as the Orchestra of the Welsh National Opera (WNO) with whom she is Principal Harp. A graduate of the Guildhall School of Music & Drama, where she studied the harp with David Watkins, Katherine plays the traditional celtic and triple harps as well as the pedal harp. Chamber music is an integral part of Katherine’s work, playing with violinist Laurence Kempton in the Enigma Duo, and joining flautist Sarah Newbold and violist Martin Outram in the Alvor Trio.